That happens so easily and quickly! EximiousSoft Business Card Designer is also professional quality printing software. It supports to export cards to image files with high quality which are printed for print shop. Also it enables to print spectacular business cards on your own printer, on card stocks from Avery, Sigel, Herma, Formtec, DECAdry etc. .. EximiousSoft Business Card Designer provides more than hundreds of background images, logos, shapes, symbols, gradient styles. Which make your art work is so simple. Besides that, you can add your own drawing elements such as shadows, texts, lines, curves and your own photos for your design. 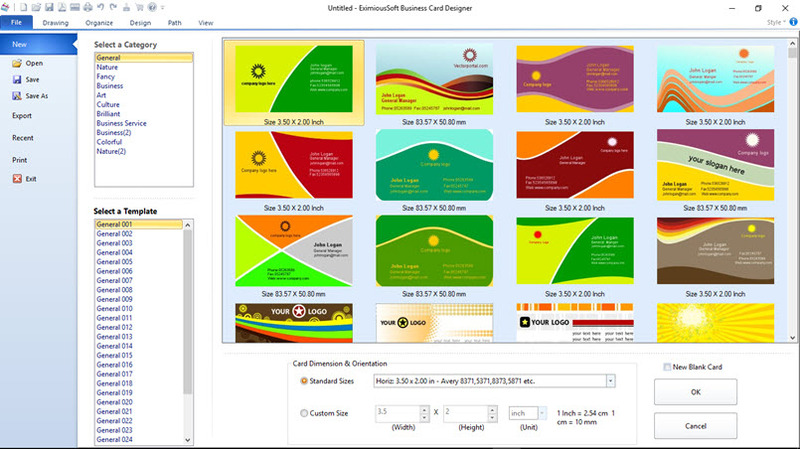 EximiousSoft Business Card Designer works like a great image editor program that supports strongly layer-editing. Each layer object is allowed to contain an alpha channel. Any vector object such as shape, symbol, text, line, and curve can be filled and stroked with solid color, image, pattern and gradient colors high smoothly with different transparency value. To create, move, resize or rotate layers/Objects only with dragging or clicking mouse button and undo or redo anytime anywhere. EximiousSoft Business Card Designer enable you create your own shapes with Custom Shape Tool, gives the option to customize the width and height of business card to suit your requirements.